Marcel Tolkowsky, a young mathematician wrote a Master’s thesis on the proportions for round brilliant cut diamonds in 1919. This became the basis for what is now known as the “Ideal Cut". Together with those of the diamond cutters in his family's Belgian business and himself, he was able to perfect the ideal proportions of the best looking diamonds with maximum sparkle and fire with applying math and physics. The proportions he chose produce a beautiful diamond. But it has taken more than 80 years for the industry to realize that his theorem predicted a range of proportions, not just the single set of parameters; he was aware of a tradeoff between maximum brilliance and maximum fire that results from varying combinations of crown and pavilion angles. The crown is the section of the diamond from the table to the girdle. There are two different measurements to consider when looking at the crown. The crown angle which is the angle made between the girdle and the table. 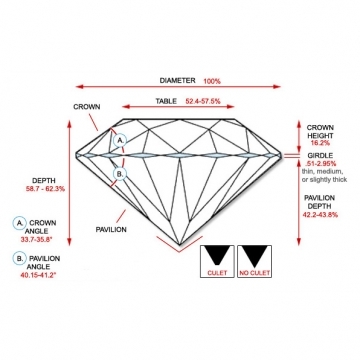 The crown angle should be between 34.3-34.7° for it to be an Ideal cut. The culet is the point at the bottom of the diamond. You will see diamonds that will have some variations, sometimes cutters have to cut the point off and make a flat facet. The facet is measured in terms of size and can be from none, small, medium or large. Ideally a pointed (none) culet is preferable as a stone with a large culet can be noticed when viewed through the table; it can almost look like a black window in your diamond.